Before the S-60 was destroyed in April 1961, Sikorsky had already begun the S-64 Skycrane project. 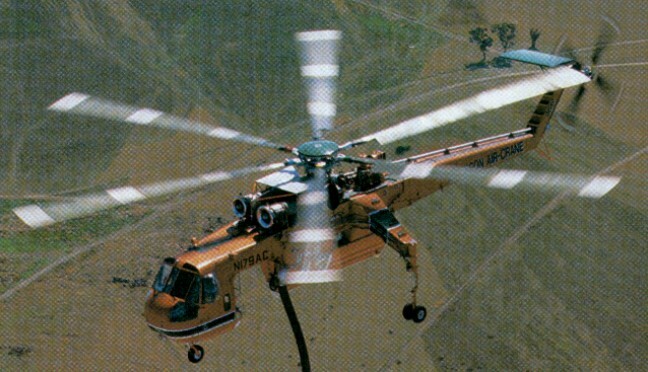 Sikorsky Aircraft produced the prototype (N325Y) of its S-64 Skycrane and this flew for the first time on 9 May 1962. The S-64 is a flying crane helicopter consisting of a basic skeletal to which can be attached large freight containers or people pods for short-haul transportation. The S-64 retained the same basic rotor system as the S-60, and had a pair of 4050shp JFTD-12A shaft turbines mounted side-by-side on top of the fuselage boom, and had no fin area below the boom, and a 42,000-lb gross-weight. Ground clearance beneath this boom is 2.84m and the main wheel track is 6.02m, hence loads of considerable size can be fitted underneath the S-64. The six-blade, fully articulated main rotor and four-blade tail rotor. Steel driveshafts. Main gearbox below main rotor, intermediate gearbox at base of tail pylon. Tail gearbox at top of pylon. Main gearbox rated at 4,922kW on CH-54A. Two fuel tanks in fuselage, forward and aft of transmission, each with capacity of 1,664 litres. Total standard fuel capacity 3,328 litres. Provision for auxiliary fuel tank of 1,664 litres capacity, raising total fuel capacity to 4,992 litres. 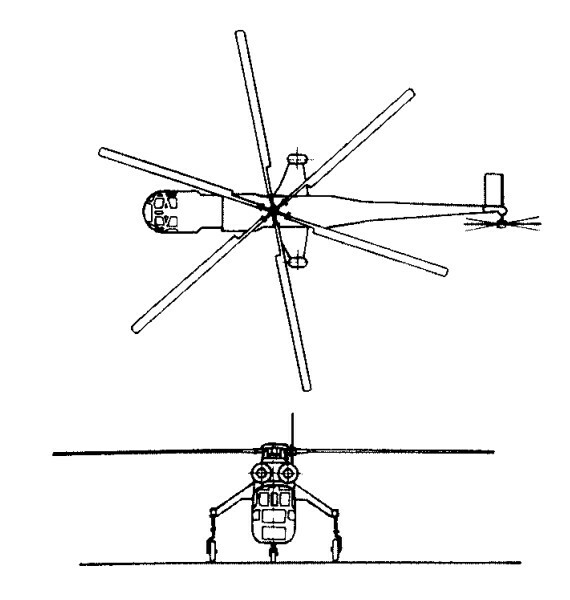 Undercarriage is non-retractable tricycle type, with single wheel on each unit of CH-54A/S-64E, twin wheels on main units of S-64F. CH-54A/S-64E mainwheel tyres size 38.45 x 12.50-16, pressure 6.55 bars. S-64F mainwheel tyres size 25.65 x 8.50-10, pressure 6.90 bars. Nosewheels and tyres of all versions size 25.65 x 8.50-10, pressure 6.90 bars. The pilot and co-pilot sit side by side at front of cabin. Aft-facing seat for third pilot at rear of cabin, with flying controls. The occupant of this third seat is able to take over control of the aircraft during loading and unloading. Two additional jump seats available in cabin. A feature of this aircraft is that the landing gear can be lengthened and shortened hydraulically, so that the helicopter can 'crouch' on to its load, raise it off the ground and then, if desired, taxi with it to a more suitable take-off point. Two additional prototypes, N305Y and N306Y, were completed for evaluation by the Federal German forces. Re-registered D-9510 (early 1963) and D-9511, they were operated under the aegis of the former Weser Flugzeugbau. 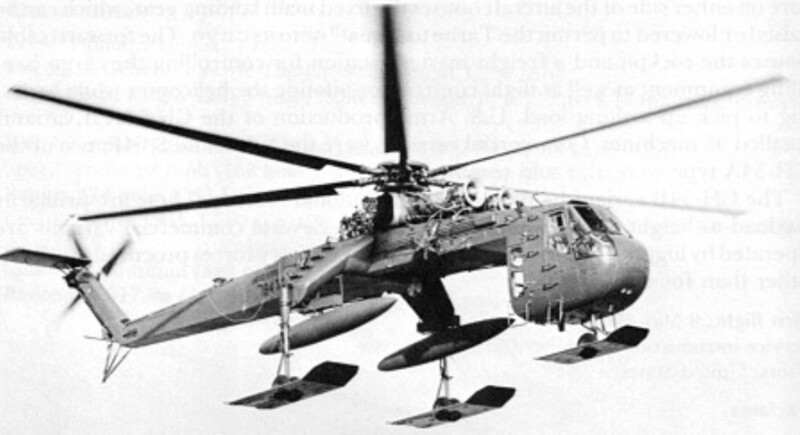 After evaluation of the original prototype at Fort Benning, Georgia, the U.S. Army placed a pre-series order in June 1963 for six S-64A's with the military designation YCH-54A and allotted the serial numbers 64-14202 through -14207. These aircraft were delivered to the Fort Benning-based 478th Aviation Company beginning in June 1964. Five of these were operated with with the 478th Aviation Company supporting the U.S. Army's 1st Cavalry Division in Vietnam. This unit took four of the machines to Vietnam for a thorough field evaluation, upon the successful conclusion of which the Army placed orders for fifty-four CH-54A production aircraft. In 1965, a CH-54 at Ft. Bragg, N.C. established a world record lift of 90 passengers. Eighteen more CH-54A's were ordered in 1966, and total orders stood at about sixty in 1968, later aircraft having uprated -4A engines of 4620shp each. A military version, designated CH-54A, gained three international height records in 1965; those involving a 2,000 kg payload to a height of 28,743 ft (8,761 m) and a 1,000 kg payload to a height of 29,340 ft (8,943 m), were unbeaten in mid-1972. Loads which can be lifted by the S-64A/CH-54A include trucks or palletised containers holding a field hospital unit, 48 casualty litters, 67 troops or 10382kg of cargo; one CH-54A in Vietnam has successfully lifted 87 troops. Meanwhile a Sikorsky-owned S-64A and the sixth aircraft of the U.S. Army's original order have been used to further the acceptance of the type for the civil market. During 1967, N325Y carried out tests on behalf of the Los Angeles Airport Department with the 23-seat Budd XB-1 Skylounge pod, designed to speed connection between the city's airports and the city centre. The S-64's cargo pod is a box 8.36 x 2.69 x 1.98m. The larger CH-54B version with twin 4800shp turbines and 2300kg more lifting power, went into service with the US Army in 1969; eventual thirty-seven CH-54Bs (serials 69-18462 through -18498). The -B model Tarhe differed from the earlier -A primarily in having more powerful engines, high-lift rotor blades, a modified main rotor gearbox and rotor head, a payload capacity increased by some 5000 pounds, and dual-wheeled main landing gear. Also under development was the S-64B/CH-54B, an enlarged three-turbine version designed to lift a 16329kg payload. In addition to its use by civil operators on a variety of duties, 80 were ordered as CH-54A/B Tarhes by the US Army. The US Army bought 97 with deliveries between June, 1964 and 1972, and in Vietnam was used to retrieve 380 downed aircraft, saving $210 million. The Tarhe served in a heavy-lift role in Vietnam, with the 478th and the 291st Aviation Companies. The Tarhe can carry sling loads, vehicles or other items on a special platform, or a detachable military pod for 45 troops, 24 stretchers, or 20,000 lb (9,072 kg) of freight. The last one was retired in 1993. On several occasions, CH-54s even served as makeshift bombers; they were among the few American aircraft in Southeast Asia that were capable of carrying, and dropping, the 10000 pound 'daisy-cutter' bombs used to create instant helicopter landing zones by flattening all vegetation (and most structures) within an area several hundred yards in diameter. On 18 April 1969, two commercial Skycranes were delivered to Rowan Drilling Company Inc of Houston, Texas, for operation in support of oil exploration and drilling operations in Alaska. 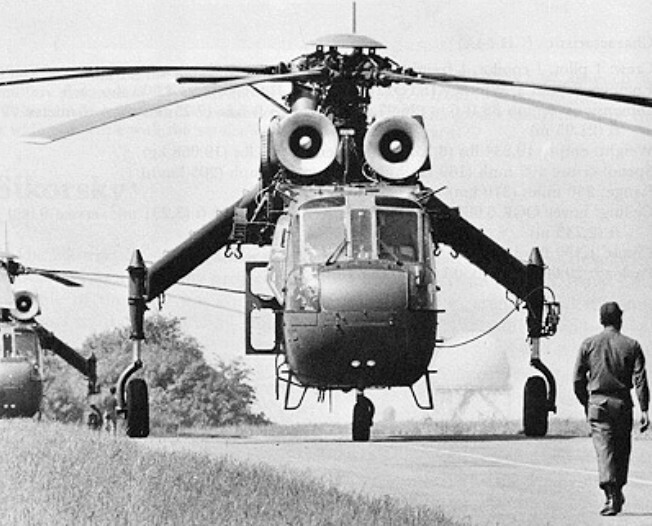 During the late 1960s and early 1970s the Tarhe was gradually superseded in front-line service by the CH-47B and -C Chinook, and all surviving CH-54s were subsequently transferred to the Army Reserve and National Guard. Withdrawal from frontline units did not signal the Tarhe's immediate demise, however, for as of early 1986 seventy-one -A model machines are shared among Georgia, Kansas, Mississippi, Nevada and Pennsylvania, while the twenty-six surviving -Bs serve in Alaska, Alabama and Connecticut. When repairs were needed to the 11000kg statue atop Washington's Capitol dome, it was lifted away and then returned by a SkyCrane. Only 97 Tarhes were built for the United States Army between 1964 and 1972. Seven Army National Guard units were still equipped with it by the beginning of the 1990s. 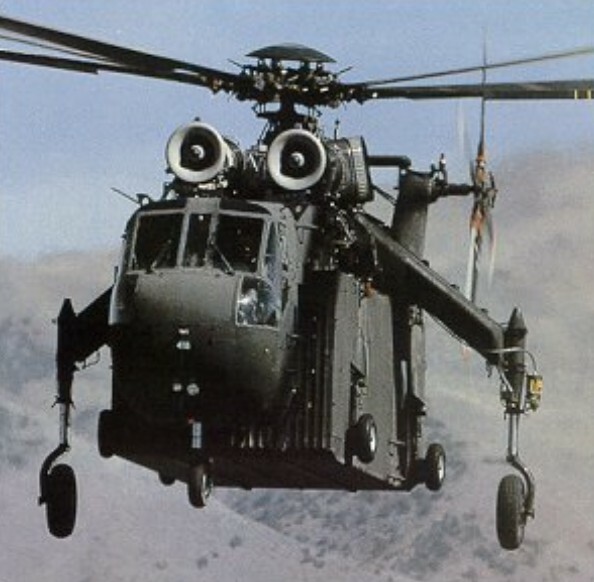 Progressively replaced by the CH-47D, the last unit to give up its CH-54s was D Company, 113th Aviation, of the Nevada Army National Guard, based in Reno, in 1993. Sikorsky also offered the Skycrane to commercial operators. The models S-64E (civil version of the CH-54A) and S-64F (derived from the CH-54B) were produced, while plans for a triple turbine version were not realized. In January 1972 Erickson Air-Crane Company of Marysville, California, purchased the first S-64E, for logging and other heavylift tasks. Erickson Air-Crane Co LLC purchased the Type Certificate and production rights for S-64 from Sikorsky on 1 February 1992, and can construct new examples to improved Erickson S-64 Aircrane standard. Erickson also developed modifications for ex-U.S. Army CH-54s to bring them up to Aircrane standard. Under this designation the first of three prototypes flew for the first time 9 May 1962 and was used by the US Army at Fort Benning, Georgia, for testing and demonstration. The second and third prototypes were evaluated by the German armed forces. Six ordered by US Army in 1963 to investigate the heavylift concept, with emphasis on increasing mobility in the battlefield. Delivery of five CH-54As (originally YCH-54As) to the US Army took place in late 1964 and early 1965. A sixth CH-54A remained at Stratford, with a company-owned S-64, for a programme leading toward a restricted FAA certification, which was awarded 30 July 1965. Further US Army orders followed. On 4 November 1968 Sikorsky announced that it had received a US Army contract to increase the payload capacity of the CH-54 from 10 to 12.5 tons. The contract called for a number of design improvements to the engine, gearbox, rotor head and structure; altitude performance and hot weather operating capability were also to be improved. Two of the improved flying cranes, designated CH-54B, were accepted by the US Army during 1969. The original JFTD12-4A engines were replaced by two Pratt & Whitney JFTD12-5As, each rated at 3,579kW, and a gearbox capable of receiving 5,891kW from the two engines was introduced. Single-engine performance was increased, since the new gearbox receives 3,579kW from one engine, compared with 3,020kW on the CH-54A. A new rotor system was also introduced, utilising a high-lift rotor blade with a chord some 0.064m greater than that of the blades used formerly. Other changes included the provision of twin wheels on the main landing gear, an improved automatic flight control system and some general structural strengthening throughout the aircraft. Gross weight was increased from 19,050kg to 21,318kg. 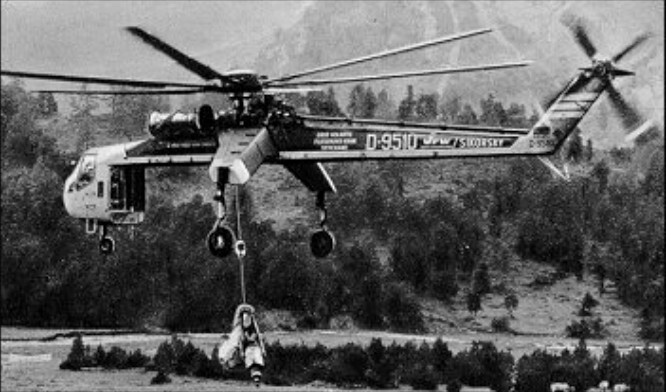 FAA certification of the improved S-64E for civil use was announced in 1969, for the transportation of external cargo weighing up to 9,072kg. Designation of a commercial version of the S-64. Engines: 2 x Pratt & Whitney JFTD12-4A (military T73-P-1) turboshaft, 3,356kW / 4,500 hp for take-off / max continuous 2,983kW. Engines: 2 x Pratt & Whitney JFTD12-5A (military T73-700) turboshaft, 3579kW / 4800 hp for take-off / max continuous 3,303.5kW.